Ford Motor Company announced this week that it’s testing 3D printing of large-scale car parts, a move that could eventually lead to the manufacturing of more fuel-efficient vehicles. 3D printing hasn’t really gone large scale like this yet, but the potential upsides are huge. What does that mean? Well, say the pilot program’s a success, Ford cars of the future might include spoilers that are made by a 3D printer, and could allow for consumers to customize parts throughout vehicles. 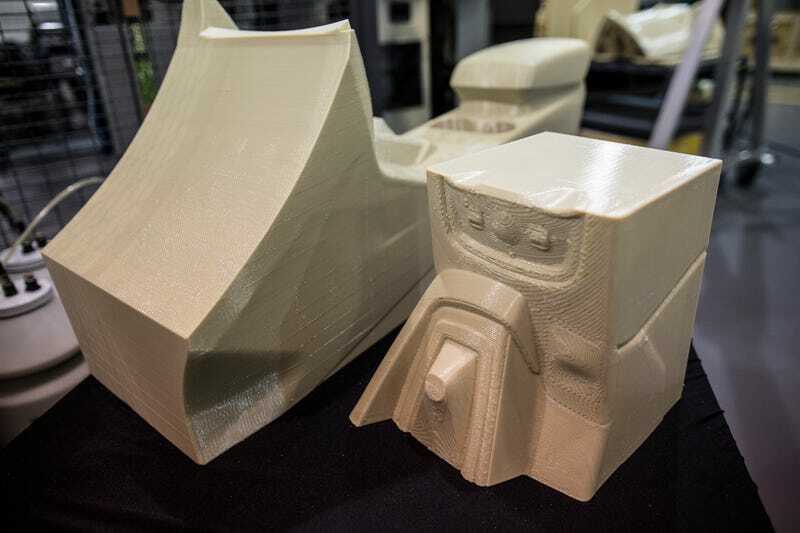 “With Infinite Build technology, we can print large tools, fixtures and components, making us more nimble in design iterations,” said Ellen Lee, Ford technical leader of additive manufacturing research, in a statement. Using traditional methods to develop, say, a new intake manifold, an engineer would create a computer model of the part, then have to wait months for prototype tooling to be produced. With 3D printing technology, Ford can print the intake manifold in a couple of days, at a significant cost reduction. The weight of the car could significantly decrease, as well, producing better fuel-efficiency. Ford, for example, said a 3D-printed spoiler could way less than half a cast metal counterpart. “Where new product development cycles were 36 months at best when I started, those cycles are now down to 18 months,” Stephenson said. McLaren Racing also recently announced it was partnering with Stratasys to use 3D printing manufacturing for the McLaren-Honda Formula 1 team. The 3D printing process isn’t currently fast enough to handle high volumes, Ford said, but it’ll be worth watching to see how this program plays out, as it has the potential to shift how the industry thinks down the line.